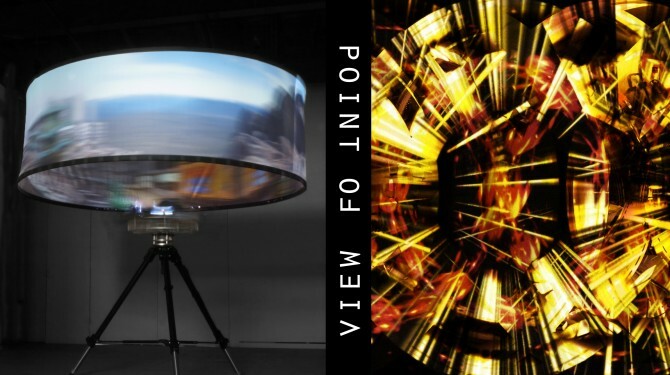 Presented by the College of Fine Arts and ISEA2013, this exhibition explores the boundaries between real and virtual space and the relationship between observer and observed. It utilises electronic media to investigate the limitations that traditional ocular optics put on our perception of mediated imagery, while also exploring and exploding the boundaries of the cinematic image. Point of View questions our understanding of place, representation and perspective. An exhibition of work by Josh Harle, Chris Henschke and Volker Kuchelmeister. Bare Island is a work in a series of interactive video pieces each set at a different geographical site. The works run on a tablet, and allow the participant to navigate through a cloud of digital images corresponding to the viewpoints of the photographs used to build the work. These images suggests the original space through their distribution. Motion through the cloud and direction-of-view are controlled using the tablet’s touch-screen interface through swipe gestures, and after a period without interaction, the view will pull out and begin slowly moving through the space by itself. The works focus on aligning the position and behaviour of the camera with the viewpoint of a virtual inhabitant, giving an embodied experience of the virtual space. Navigation is driven by touch-screen gestures; the experience of interacting with the work an enveloped, tactile experience “moulded by hapticity and peripheral unfocused vision”. Looking around the space is smooth and intuitive, setting up a direct tactile engagement between the work and the audience through dragging the view, like moving foliage aside on a path through the jungle. Josh Harle is a mutli-disciplinary PhD candidate researching Tactical Space through an Australian Research Council Linkage grant. He has a background in Computer Science, Fine Art, and Continental Philosophy, and works between the School of Design, COFA, and the Faculty of the Built Environment, UNSW. His practice involves the development of software to map, scan, and visualise physical space, as well as the creation and exploration of virtual environments as potential sites for both poetic, creative expression and rationalisation, digitising and ordering of space. Image: Photo of screen, courtesy of the artist. The inaugural showing of a complex work which re-images and recontextualises scientific theories and processes, shifting the empirical perspective and playing with the concept that the observer aﬀects the observed. This aﬀective relationship between observer and observed is, paradoxically, a cornerstone of contemporary particle physics – paradoxical because it opposes the emphasis placed on objectivity within empirical science. 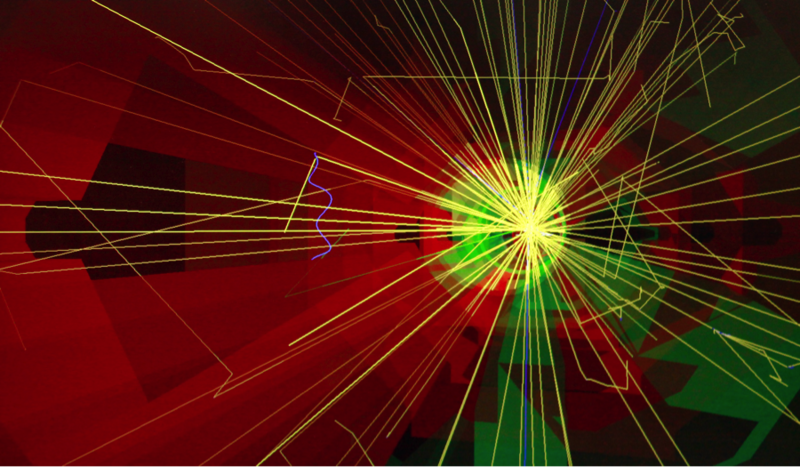 Using particle accelerator simulations, the work converts real synchrotron data into unique visual forms visually manifest through a combination of realtime digital 3D modelling, kinetic sculpture and projection mapping. Lightbridge was developed during a Synapse residency at the Australian Synchrotron (2010), supported by the Australia Council and the Australian Network for Art & Technology. 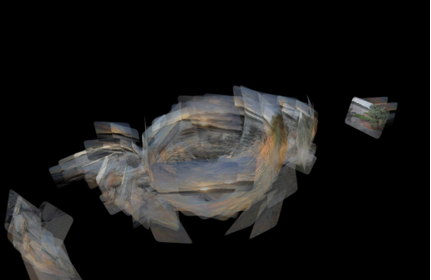 Chris Henschke is a self-taught artist who works with digital media. His practice revolves around sound and visual relationships, and collaborative art / science experiments. His work has been shown around Australia and also internationally, and he has been awarded a number of residencies in Australia and internationally. He lectures in media at RMIT University, and in Art vs Science at the Victorian College of the Arts’ Centre for Ideas. He is Director of Experimental Applications at the V-Room at RMIT University, is Artist in Residence at the Australian Synchrotron, and was organiser of Colliding Ideas – Art, Society and Physics, a satellite symposium to the 36th International Conference of High Energy Physics in 2012 (where the announcement of the discovery of the Higgs Boson was made). This project was supported by the Australia Council, the Australian Network for Art & Technology, and the Australian Synchrotron, through the Synapse residency program. Developed in collaboration with Dr Mark Boland, Accelerator Physics, Australian Synchrotron, with X3D programming by Ross Taylor. Image: Installation view of Juxtaposition, courtesy of the artist. By juxtaposing two radically different environments, the Tasmanian wilderness and the extreme urban development of Hong Kong, this interactive installation explores place and representation. 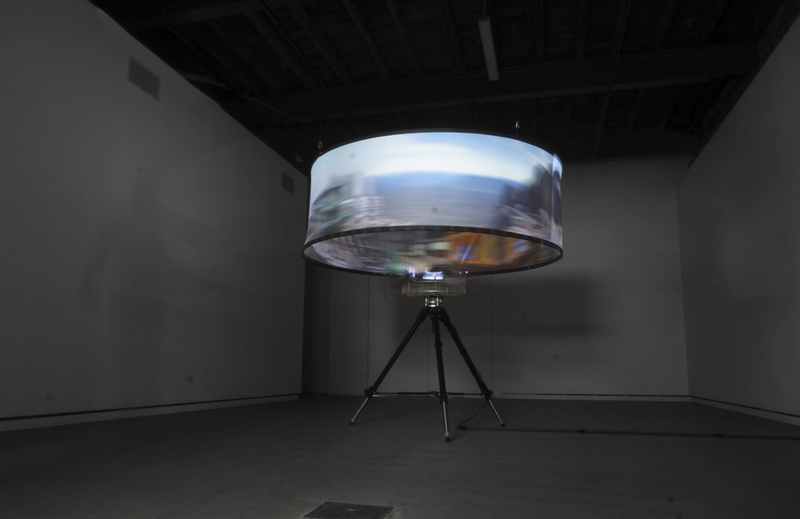 In an apparently endless stereoscopic 3D giga-pixel panoramic montage, the two locations merge seamlessly from one into another as the observer manually turns the circular ‘screen’ to control both the viewpoint and the related soundscape. Volker Kuchelmeister is a media artist, an academic staﬀ member at the College of Fine Arts, UNSW, Sydney, and a Research Fellow at COFA’s iCinema Centre for Interactive Cinema Research. His work encompasses experimental film, expanded cinema, photography and video installations, as well as the development of custom camera systems and projection platforms. He is particularly interested in human perception, the formation of memory and strategies in human-computer interactivity, while exploring and exploding the boundaries of the cinematic image. His work has been shown internationally at museums, galleries and festivals, including ZKM Centre for Art and Media, Karlsruhe, Germany; Centre Pompidou, Paris; and Powerhouse Museum, Sydney. In the performing arts he has collaborated with, amongst others, Robert Lepage, William Forsythe, Saburo Teshigawara and The Wooster Group, NYC. Supported by COFA (College of Fine Arts), UNSW, the iCinema Centre for Interactive Cinema Research and ASPERA Australian Screen Production Education & Research Association.